The Chevrolet Volt has only been available to buy in Europe since 2011 but it has already made a big impact on the market. It follows on from a number of other hybrid cars, most noteworthy of which is probably the Toyota Prius, but you'd be a fool for thinking that it's yet another boring, eco-friendly vehicle vying for your attention. 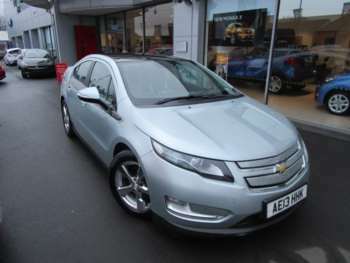 The Volt stands out thanks to its bold styling, impressive engineering and pure practicality. It was first showcased back in 2007 as a concept and the creators wanted to achieve a 40 mile minimum range when the car runs on its built-in battery pack alone, which was something that they eventually achieved. 40 miles was set as the ideal electric range because studies found that most commuters in Chevrolet's native US do not travel as far as this on their daily round trip to work. This applies pretty well to the UK as well, particularly for those living in urbanised areas where the office is only a short drive from home. It's necessary to point out that the 40-45 mile range of the Volt's electric engine with a fully charged battery is supplemented by a 1.4 litre petrol engine that helps it reach up to 300 miles when you need to do some motorway driving. It's this hybrid combination that makes the Volt so appealing, because you can manage your commute with electric power and then head out on longer jaunts with petrol fuelling the trip. Stylistically the Volt is a bit all over the place, but then it's almost been put together to look like a futuristic mishmash and ultimately it works well. It's got aggressive lines and the look of a coupe, but you get four doors here and there's even a spacious boot to store luggage. Things get really sci-fi up front where the dash consists of twin touchscreen displays that control everything that's going on with the car. You'll get real time info on how your driving is affecting the car's fuel efficiency and performance, with the idea being that you can actually learn to become a greener driver as a result. While some see American cars as having an inferior level of finish and build quality when compared with their European counterparts, the used Chevrolet Volt is pleasingly devoid of major faults in this area and won't look too shabby sitting next to a German equivalent. Because the Volt is a bit of an odd ball, albeit one with bags of potential, it's not widely available on the used market. You'll pay over £25,000 if you can find a second hand one nearby, while the reality is that you'll probably be looking at closer to £28,000 all in. You can offset this investment against the savings you'll make when it comes to fuel costs. You'll be able to fully charge the battery for just £1, which means that it'll cost you just £20 to cover a cumulative distance of 900 miles. You should ideally have a garage in which to store and charge the Volt overnight, which does limit its appeal somewhat, but doesn't stop it from being a surprisingly experimental car. 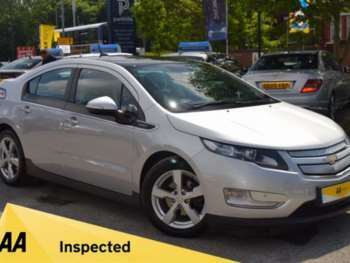 The Chevrolet Volt for sale is new enough that no major issues have arisen, but with such a technically advanced car you'll want to see a fully stamped service book and plenty of paperwork. This is a top tier car when it comes to components and mechanicals, as well as being a relative rarity, so expect to pay a premium for replacement parts. Of course used models should still be under warranty at this point, which should help to cut the costs of maintenance. While the 1.4 litre engine and electric motor combo might sound a little weedy, the used Chevrolet Volt is definitely a competitive performer. With a 0-60mph time of 8.5 seconds and bags of torque, it never feels like it lacks get up and go. The petrol engine only kicks in when you really put the car through its paces, with the transfer being seamless and everything working with surprising simplicity. Of course you'll have to familiarise yourself with its somewhat overbearing onboard interface, but that comes with the territory.